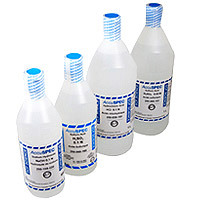 A full range of titrants are available for both Acid-Base, Oxidation-Reduction Titrations. Products are available in a wide range of concentrations and volumes as well as custom formulations. • Titrants available in multiple concentrations. - Flexibility in selecting the best concentration that fits your analytical requirement.